My first bird book was The Observer's Book of Birds published in 1952 by Warne. This small book had first been published with a slightly different title The Observer's Book of British Birds in 1937. I recall saving up to buy the three volumes of T.A. Coward's book The Birds of the British Isles and their Eggs first published in 1926 by Warne. My edition was reprinted in 1960, but even then it felt decidedly old fashioned particularly when I received for Christmas 1961 a copy of "A Field Guide to the Birds of Britain and Europe" by R. Peterson, G. Mountfort, and P. Hollom published by Collins. This book was a revelation and a revolution. You could carry it with you and in the skilled drawings for each species a line pointed to each of the distinguishing features. Peterson's work was the start of these useful field guides and now there are many on the market some based on drawings and others based on photographs. 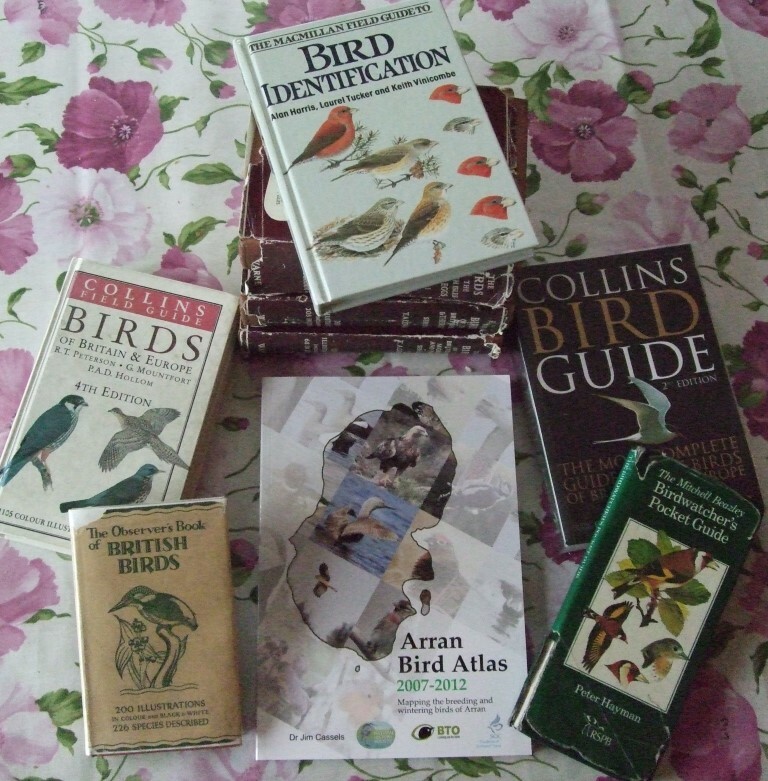 Two of my favourites are the well named Michael Beazley's Birdwatcher's Pocket Guide first published in 1979 (reprinted as The New Birdwatcher's Pocket Guide to Britain and Europe in 2002) and Collins Bird Guide by L. Svensson, K. Mullarney and D. Zetterstrom. The excellent second edition was published in 2009. As well as field guides, there is now available a wide range of other bird books, including books on individual families or species, books on themes like migration and books on countries or areas. If there was one book that I would recommend for people interested in Arran and its birds this Christmas, it would have to be the Arran Bird Atlas 2007-2012 published this year by the Arran Natural History Society. This was based on five years field work involving over seven hundred people submitting over 36,000 records on one hundred and seventy-seven species. In the one hundred and sixty-eight page publication there are more than four hundred maps and more than two hundred photographs. This is available from outlets throughout the island for only £8.00, thanks to support from the Arran Trust and two other birding organisations.